Opinion: The 99 Percent Fight Back - Finally! Beneath the place that is now Foley Square, in lower Manhattan, there was once a spring-fed pond. The pond sent out streams that flowed east and west to the East and Hudson rivers, which pour around the southern tip of Manhattan into New York Harbor, which in turn opens through the Narrows and across another bay to the wide Atlantic Ocean. Now, play that backwards — ocean through bay through straits to harbor, harbor to rivers, rivers to streams to pond. Skip to 2011, and you get a sense of last Wednesday’s march in support of Occupy Wall Street. It’s a confluence of people, a vast fluidity of feeling funneled into a small space, eddying and mixing, freshened by an underground spring: the kids camping a few blocks south in Zuccotti — renamed Liberty — Park, and their proliferating spawn across the nation (including in Burlington). The unions streamed into Foley Square — nurses and professors, bus drivers and janitors — along with the unemployed, students who walked out of their classes, babies in Snuglis, brass bands and spackle-bucket drummers, vegan freegans and (as one sign identified its holder) “meat-eating, sports-loving, car-owning, working professional father-husband”[s]. The laid-off Greeks were there in spirit, too, the fed-up middle-class Israelis, the Arab revolutionaries and — in the flesh, camping out with the Occupiers — the young “Indignados” of Spain. If you had to describe them all, OWS’ of-the-moment class-conscious catchall did it best: the 99 Percent, who are struggling so the 1 Percent can get richer. Estimates put the number of protesters as high as 30,000. After weeks of dismissive, seemingly willful perplexity, the lamestream media (Sarah Palin’s phrase is apt) have managed to capture two of the dominant feelings: anger and frustration — at anything from onerous student loans to capitalism itself, or, as the New York Times put it, “whatever.” It’s no surprise that the beneficiaries of the kleptocracy are not going to get it, or at least not publicize what they do get. Still, anger and frustration were not the main emotions rising from Wednesday’s crowd, nor are they in the village flourishing between Ground Zero and the Stock Exchange. First, there is relief that someone is finally — finally! — naming the real crime, not just the little misdemeanors and ethics violations, and the real culprits. And after that, there’s elation. Enter Liberty Park, past the tall steel Mark di Suvero sculpture (called “weird red thing” on the map printed in the Occupied Wall Street Journal — yes, the protestors have a newspaper). Make your way around the library and the medical station; peruse the signs arrayed on the ground (“I came all the way from Massachusetts and all I got was a lousy summons.” “Prohibition has led to the Toxic Planet”). Wade in amid the improvised camping gear (the park’s private owners banned tents and sleeping bags). Scramble over the low walls undoubtedly erected to prevent this very sort of gathering; grab a plate of homemade pasta and curried carrot-cranberry salad (or, if you prefer, a free hand-rolled cigarette). Turn in any direction and strike up a conversation — with a retired Puerto Rican Mennonite immigrations-rights counselor, a German IT consultant, a Jamaican community college student, an unemployed union electrical worker from Boston, a Hare Krishna in saffron-colored Crocs. Talk and talk. You cannot tear yourself away. Because, in the middle of this bleakest of bleak times, you are unexpectedly, irrepressibly happy. Barely a month into its life, OWS is fielding challenges from all sides. What are its demands? What are its plans? Who are its leaders? The left is impatient. The Democrats are nervous. And the right — suddenly upstaged by a bunch of scruffy kids — is hatching conspiracy theories. 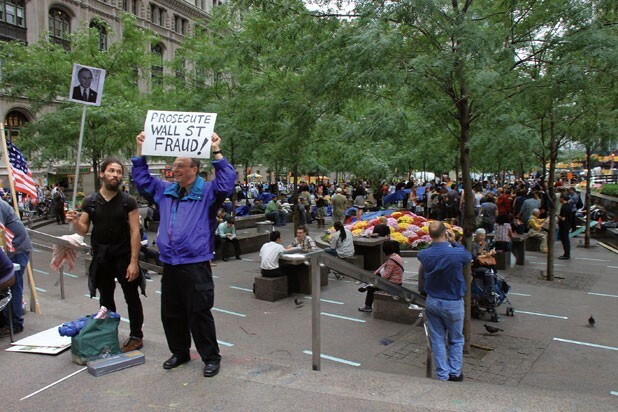 The funniest one, advanced by Timothy Kelly, an opinion writer for the brokers’ newsletter Forex, is that OWS is “a premeditated and staged event by Democrats to reinvent the party and liberal causes. The very convenient and deliberate escalation of this movement has been managed by professional PR personnel, funded by an established organization and orchestrated from a higher level from the beginning.” Ann Coulter is calling the Occupiers Nazis. In the park, OWS is trying to get its political act together while inventing an anarchist minibureaucracy. Everyone is fed, trash is cleaned up, compost collected. Committees — Comfort, Legal, Facilitation, Finance — meet, along with a nightly General Assembly (Finance to GA: “We’re trying to put in place the proper protocols...”). But the neighbors are complaining to the community board about disruption of their “quality of life.” The city, having struck a kind of truce by ceding the park to the Occupiers and setting the police on them when they stray, may be considering evicting them. And yet, they keep working at that perennial utopian experiment, described by Monica Lopez, from Madrid, as she stood on a wall speaking through the ingenious human sound system by which each of the speaker’s phrases is repeated by a group so the crowd can hear. “It is a new kind of politics,” Lopez said. It is a new kind of politics (repeated the repeaters). I don’t come here to affirm who I am already. But to discover who I can be with other people. ... how the city can be. Occupy Wall Street doesn’t have demands — yet. It has desires. Let the springs flow.